The Winter Tanners is a challenge walk or run of 20 or 30miles around footpaths and bridleways in Surrey with minimal support. The event is put on by the Surrey LDWA and as a result is a bargain at £6 and is usually run around mid-January each year with the route being reviewed and tweaked each year. So whilst a lot of people had entered the Country to Capital on the Saturday, all the cheapskates (me included) were running the Tanners on Sunday as I recognised and said hello to a few familiar faces at the start (Shout outs to Rob Jones, Peter Johnson, Peter Chandler, Dan, Glynn and Martin Bacon). Matt Dunn and I were running the event together and this had been a planned training run for us. I’m still recovering from a knee injury I suffered in November but back to some running although its still not 100% so a long plod around Surrey sounded about right. Each competitor is given a detailed set of instructions to follow and when I say detailed, I mean detailed! (For example, there were 2 paragraphs of instructions for the 1st mile). Competitors collected their number at the start, saw the marshal who records your start time and off you go. With a 20-mile and 30 mile version and a mixture of runners and walkers people set off at different times (walkers first, then runners generally). It was pretty cold and crisp at the start although after running a few miles, I started to warm up and had to remove my jacket. Navigation wise, Matt and I took a slight detour early on but didn’t have any real issues for the rest of the race but there was a lot of stopping and starting whilst we kept checking instructions and directions. 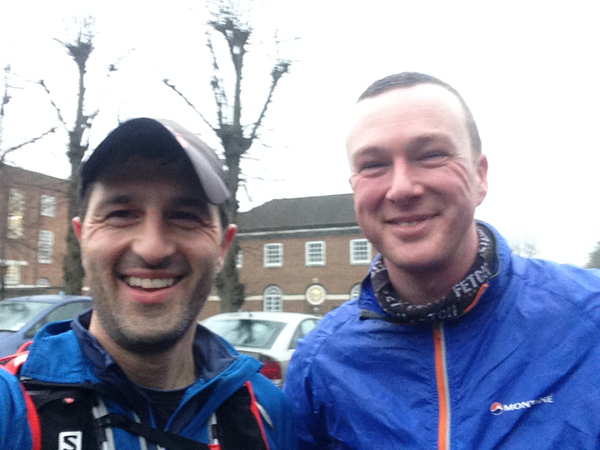 We found ourselves running alongside Martin Bacon and a few people and there was some good-natured banter between us (especially as they had witnessed our slight deviation early on!). I did note the other group had a good system where one person would keep calling out the instructions for the lead runner to look out for and they tried to keep a constant jog going. (Matt – note for next time). It took me about 3 or 4 miles to settle into the run to be honest. The route was undulating and muddy from the start and the cold meant there was a sharpness in your breath and it was a real stop start effort with the navigating. Matt and I covered the first 10 miles or so in about 2 hours. To be honest there wasn’t a massive amount of conversation, which was largely down to me as I wasn’t really “into” the run at the moment. We also passed through the first checkpoint and took onboard some squash and munched through some jaffa cakes and biscuits. Matt had been taking a lead on the directions and was edging ahead when running; it was obvious to me that my own fitness wasn’t quite there at the moment. The 10-15 mile section was more runnable with slightly less twists and turns and we picked up the pace at this stage although slowed a bit between the 15-20 mile leg passing Checkpoint 2 about 4 hours into the race. The ground conditions were fairly horrible, mud, mud and more mud which resulted in a few stumbles and slips from the both of us at times. I also had the pleasure of attempting to quickly pass some muddy section but managed to sink my foot into a deep section of mud which gave that satisfying squelching sound and the threat of your trainer coming off your foot, not once, not twice but three times. I had been wearing a pair of recently acquired Salamon trail gaiters which did an admirable job in the mud. Can’t think of a better test than around a boggy Tanners course to be honest. In addition I was also wearing some of the Red Venom compression leggings which I was lucky enough to win on Fetch and my experience was that they felt comfortable and hopefully eased muscle stiffness on the run (although I find this type of performance is difficult to judge). We were also passing a lot of walkers during the run by now and said a quick hello to people as we trotted (slowly) past them. My knee was getting a little sore with this being my longest run for a couple of months, so I took an ibuprofen and decided that it might be best to keep up the pace and finish this event as quickly as we could. Matt commented that I “woke up” around the 20 mile mark as our conversation picked up dramatically and I started to lead the pace at times and take a more active roll with the directions. My knee was groaning a bit and felt particularly sore on the downhill sections but I really enjoyed the last 10 miles as I was in a more positive mental state, liked the forest trails more and found this section a bit more runnable despite the constant ups and downs. 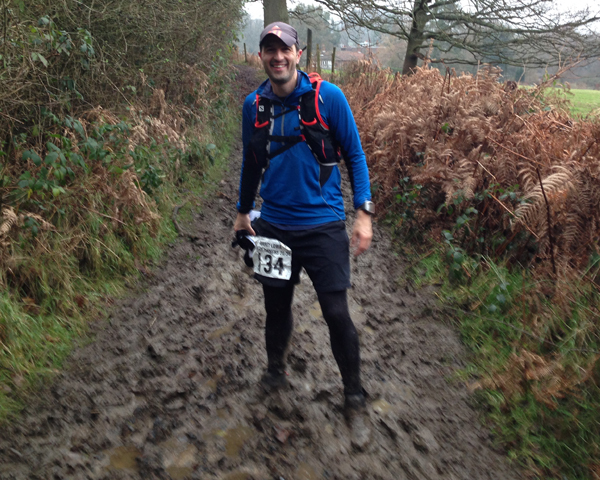 The only downside was that some of the last section was again really muddy especially through the fields. We arrived at the final checkpoint, grabbed a drink and snack and headed off to complete the final 5 miles. It was a nice to see I actually still had a bit of running at this stage of the event, so there is some fitness there but lots more to do before the bigger races in 2014 but I have a few months to work on this. The time seemed to pass quite quickly for this last section as we jogged the majority of this and then Matt started to recognise some landmarks, which was a return of the initial section. We arrived back at the start in a time of 6hrs 11mins which was about expected for us with my current fitness coupled with the undulating nature of the route, navigation time and ground conditions. The boys make it home. Picture – shameless selfie. 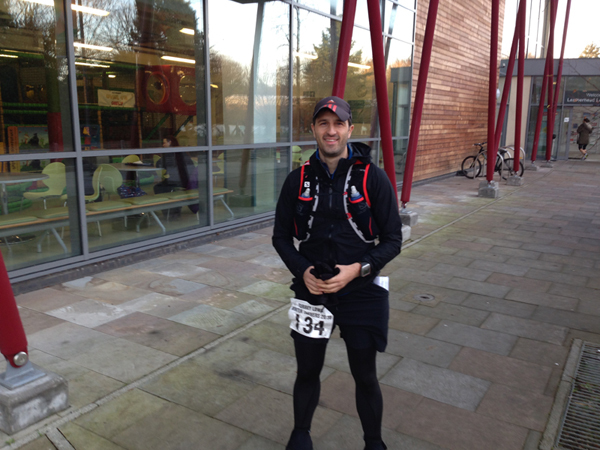 Overall, it was a good training run but a long muddy slog. 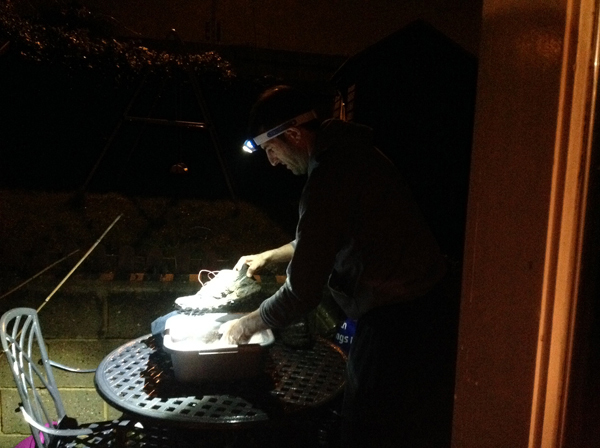 In fact, my trainers and some of my kit were so muddy I had to do the pre-wash in a bowl of water before you do the real wash as pictured! The pre-wash wash. Sneaky picture by Sal. Thanks to the Surrey LDWA for a well organised event and Matt for some good company on the day.